Austerity means that people is [sic] expulsed of their homes. Austerity means that the social services don’t work anymore. Austerity means that public schools have not the elements, the means to develop their activity. Austerity means that the countries have not sovereignty anymore, and we became a colony of the financial powers and a colony of Germany. 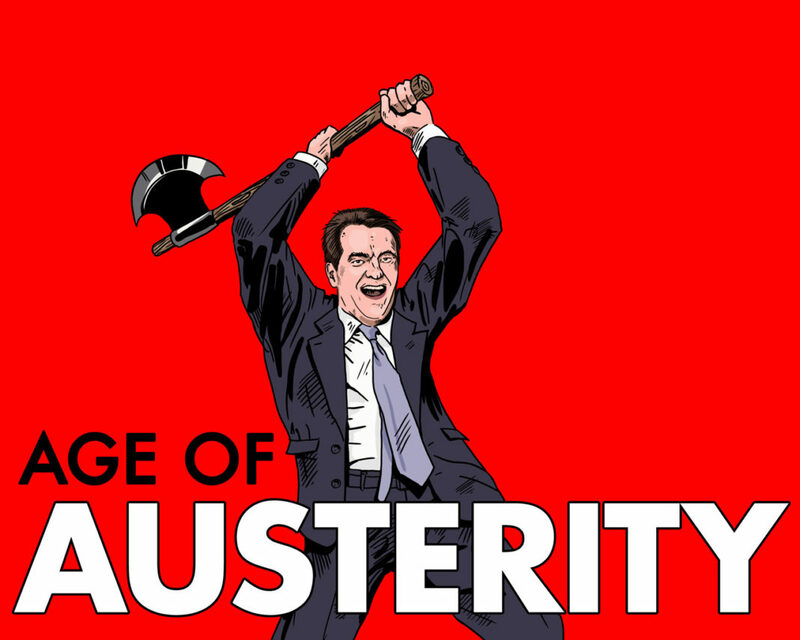 Austerity probably means the end of democracy. I think if we don’t have democratic control of economy, we don’t have democracy. It’s impossible to separate economy and democracy, in my opinion. Austerity is a lie. It is a cruel economic policy that starves economies, puts people out of work, privatizes public services, closes public facilities, eliminates benefits for the needy, and crushes governments with unsustainable debt. And as Iglesias says above, austerity diminishes democracy because the banks hold the economic power– not the people and the governments they elected. Greece has been suffering under austerity imposed by the European banks since 2010. Instead of growing the Greek economy, austerity has starved it. Does this sound familiar? Arizonans should pay close attention to the Greek financial crisis because Governor Doug Ducey is leading us down the same road to ruin. Arizona and other red states have been on the austerity path since the financial collapse of 2008-09. People have lost their jobs, their homes, and their health insurance. Instead of helping citizens recover financially, Republican-controlled federal and state governments have imposed austerity and cut unemployment benefits, food stamps, public education, childcare assistance, job training, and many anti-poverty programs. Instead of putting people back to work to grow the economy, these states have laid people off, further starving the economy. The primary difference between austerity imposed in Greece vs here in the US is that Republican-controlled governments in Arizona, Kansas, New Jersey, Wisconsin, Louisiana, Ohio, and elsewhere are cutting state budgets, services, and employees, but they are also cutting income by doling out unaffordable corporate tax cuts. The Greeks, on the other hand, are trying to pay off billions of dollars in bailout loans provided by the worldwide banking cartel– the same banksters that crashed the world economy and started all of this. Greece has a 25% employment rate, they have cut their public sector by 40%, and young college-educated Greeks are leaving the country to find opportunities elsewhere. Greece’s $267 billion debt is 170% of their Gross Domestic Product (GDP)— up from 130% in 2009– and the percentage continues to rise. Why is the Greek debt a larger percentage of the GDP than it was at the beginning of the global financial crash? Austerity. The austerity measures imposed upon Greece were supposed to help the country bring down their debt. Unfortunately, austerity shrank the Greek economy by more than 25%, making the debt a larger percentage of the economy. Rejecting austerity, the Greeks ousted its pro-austerity government and elected a left-wing government that vowed to fight European austerity. Alexis Tsipras of the Syriza Party became prime minister in January 2015. Professor Noam Chomsky told Amy Goodman that the European reaction to the Syriza party was “extremely savage. They made a little bit of progress in their negotiations, but not much. The Germans came down very hard on them… [The Germans] sort of forced them [the Syriza leaders] to back off from almost all their proposals. What’s going on with the austerity is really class war. As an economic program, austerity, under recession, makes no sense. It just makes the situation worse. So the Greek debt, relative to GDP, has actually gone up during the period of—which is—well, the policies that are supposed to overcome the debt. In the case of Spain, the debt was not a public debt, it was private debt. It was the actions of the banks. And that means also the German banks. Remember, when a bank makes a dangerous, a risky borrowing, somebody is making a risky lending. And the policies that are designed by the troika, you know, are basically paying off the banks, the perpetrators, much like here. The population is suffering. But one of the things that’s happening is that the—you know, the social democratic policies, so-called welfare state, is being eroded. That’s class war. It’s not an economic policy that makes any sense as to end a serious recession. And there is a reaction to it—Greece, Spain and some in Ireland, growing elsewhere, France. But it’s a very dangerous situation, could lead to a right-wing response, very right-wing. The alternative to Syriza might be Golden Dawn, neo-Nazi party. In a dramatic move, the Greeks voted 61 to 39% to reject austerity measures a week ago in a nationwide referendum. They voted “no” to further budget cuts and tax hikes in exchange for a rescue package from European creditors. “Today, all of us together turned a bright page in modern European history. We proved that even under the most difficult circumstances democracy cannot be blackmailed. Today, considering last week’s very difficult circumstances, you made a very brave choice. However, I am fully aware that the mandate here is not a mandate to break with Europe, but a mandate to strengthen our negotiation position to seek a viable solution,” Tsipras said on July 6, after the “no” vote. Only a few days after the vote, Tsipras submitted a bailout proposal including austerity measures that the people voted against. Greek Prime Minister Alexis Tsipras has submitted a bailout proposal which includes harsh austerity measures, just days after the Greek people overwhelmingly rejected such measures in a historic referendum. The proposal submitted to Greece’s creditors reportedly includes tax increases, pension cuts, a reduction in military spending, and the privatization of public assets. It comes after Tsipras himself had urged the Greek people to reject creditors’ demands for further austerity. In exchange for the reforms, Greece would receive a three-year, $59 billion bailout package. Germany, meanwhile, appears to be yielding to demands to provide at least some measure of debt relief to Greece. Why did Tsipras cave? Economist Mark Weisbrot of the Center for Economic and Policy Research called it a “hostage situation,” the Greek banks had been closed for days. What sets this apart from past deals is that Greece is lobbying for debt restructuring — not just new loans to pay off the old ones. The agreement he struck with other European leaders early Monday after a contentious all-night bargaining session would give Greece the chance to receive its third international bailout in five years, a package of as much as 86 billion euros, or $96 billion, as well as easier repayment terms on some of its existing debt of more than 300 billion euros and a short-term economic stimulus plan. But it would require Greece to swallow a wide array of measures, including pension cuts and tax increases, and effectively subject itself to intensive international oversight in order to qualify for the aid. Monday’s deal between Greece and its creditors makes a mockery of the ruling Syriza government’s democratic mandate for economic relief, which was reinforced by a July 5 referendum vote in which Greek voters rejected a deal that was far more moderate than the current one. The popularity of the hashtag #ThisIsACoup on Sunday expressed the view of many Greeks and citizens around the world that democracy had died in the negotiating room at the hands of Greece’s creditors. For years, the citizens of Europe have been protesting against austerity. In Spain and Greece, leftist political groups have risen to power, promising to end austerity and help the people. In the US, there have been spotty protests against budget cuts and austerity, but the people have not been as vocal as they have been in Europe… until now. Self-proclaimed socialist and Democratic Party candidate for President Bernie Sanders has been drawing record crowds to his stump speeches across the country– 10,000 in Madison, Wisconsin; 5,000 in Minnesota; 700 in Des Moines; 1000 in Keene, NH. We can provide healthcare to every man, woman and child as a right. We can make certain that every person in this country can get all of the education he or she needs, regardless of the income. We can create millions of decent-paying jobs. We can have the best child care system in the world. In the last 30 years, there has been a huge redistribution of wealth from the middle class and working families to the top one-tenth of 1 percent. Our job is to reverse that, redistribute wealth back into the hands of working families. Sanders is right. Austerity is a cruel economic policy that has done nothing but create unnecessary financial distress for citizens and local/state governments, while fattening the 1%. We have have the wealth and the means to end austerity, but we lack foresight and political will to do so. As long as the moneyed class can buy elections in the US with unlimited amounts of cash and install Wall Street-friendly politicians in Congress and State Legislatures, real change will be nearly impossible. Austerity is a lie. There’s plenty of money. The problem is that the money is invested on Wall Street– not Main Street. Previous articleBloom County Comic Strip Returns! Wonderful article, Pamela. I’ve been following the Greek situation closely and also what’s going on in Wisconsin, Kansas, Arizona, etc. It feels like “they” (the global capitalist oligarchs) are tightening the noose around “our” (the other 99%) necks a bit more each day. 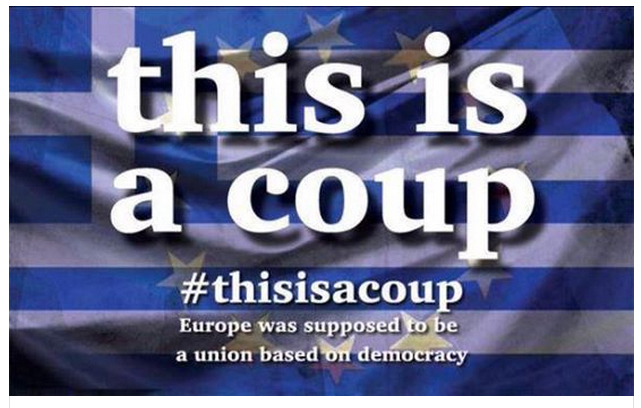 In Greece, it’s sickening to see how they have squashed the people’s democratic impulses like a bug. Germany is firmly in charge and Schäuble is absolutely ruthless. Here in the US, if Scott Walker were to win the presidency (remember, he’s the Koch’s boy), hold onto your hats…it’ll be a rough ride. 1. How many bankers have gone to trial or jail since 2008? I think the answer is none. The book Griftopia by Taibbi explains it. Some banks paid some fines but no one went to jail. The people who created the 2008 meltdown got their bonuses. And repeal of glass stegal set it all up – and who signed that into law? 2. Some of the Greeks decided many years ago to cheat on income taxes. Just maybe IF they had paid taxes, they would be better off. 3. Greeks have a high percentage of govt jobs. I think its close to 50 percent. Most govt jobs do not create income. A prosperous country needs private sector jobs. 4. Greeks have been retiring at 52. With longer life spans this makes little sense. Here the muni retirement plans are underfunded 2-4 trillion (remember Detroit, Central Falls, Stockton ?). 5. Here in the U.S. many of our pols are worth millions. Some leave office with tens of millions and go on to Wall St. And Wall St people go to govt. 6. Let’s remember who helped cook the books in Greece. And how big profits were made shortly thereafter. 7. I am waiting to see how many of the wealthiest pols will donate some of their money to the commoners. I cannot seem to find one reference where even one of them sent in extra funds on April 15th. 8. the solution to me after reading around 25 books (authors from all political parties): a full audit at the fed res. Expose things to the public that refuses to read and sits in front of the tv every night. Every company or person can be audited so why not the fed reserve? And yes a public bank is also necessary. My guess is neither of these topics will be brought up in any debate – yet the people will vote for one of the 2 picked establishment candidates. If the people cannot get answers to questions that affect them it amazes me why they vote for more of the same. We need a real people’s party. Yes I know MSM will discredit it but the people have to see through it. If there is a link people should see here it is usdebtclock.org Now if we cannot pay off the 18 tril past debts, how will we pay the debts going forward? Its all on the bottom line of the link. The most dreaded thing for the elites is a population that reads. And questions authority. FWIW – most of the super wealthy read lots of books. I do not get into this blame the other establishment party stuff. I see both of them as one and the same. More wars and more debt. Its not the 1 percent, its the .01 of 1 percent that are making the money and calling the plays. The 1 percent is taking the blame and the 99 percenters are sheeples who refuse to open their eyes. That .0001 percent is laughing all of the way to their billions more. Since when is living with-in your income wrong? I like Ducey! Yes, that was a quote, and they didn’t give the guy’s full name. I’m assume they mean Francis Fukuyama. The article is very well done except for the reference to Fukuyama “Within just a few years of Fukuyama’s pronouncement, protesters in Western nations and governments and people in the global South began suggesting…” I didn’t see any reference to him before that. Also, it is an apt conclusion to pair the Greek austerity to the austerity we have been experiencing here in Arizona and in other red states. The Republicans in control of those states cut revenue to create budgets that have deficits due to those cuts, then demand cuts to government services to balance those budgets. We have seen no evidence that tax cuts to corporations and the rich stimulate economic growth; rather our experience has been that result is stagnation or contraction leaving oceans of misery in the wake.